For both the 2600 mAh Seidio and the 2800 mAh Mugen battery, you will also need to use an included extended back cover that will add to the thickness of the phone. Unfortunately, these covers are not touchstone-compatible, but there are services that you can take advantage of to convert your Pre/Pre+/Pre2 extended back cover to work with the touchstone. Sadly, no such service exists for the Pre3. 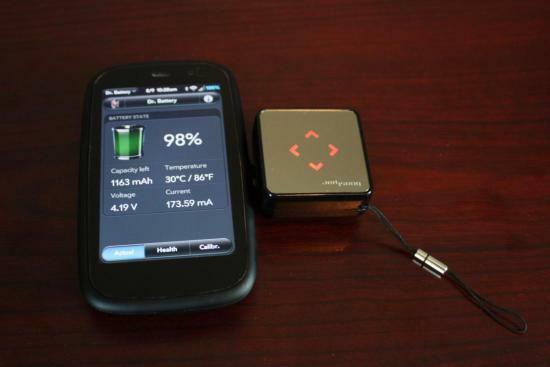 As the smallest and most compact of the battery packs, the Qmadix BoostPac 1000mAh Lithium-Ion Cube, available in the webOS Nation store for $36.95, is just 1.5 inches by 1.5 inches across and 3/4 of an inch high, and weighs just 1.6 ounces. It has built-in micro- and mini-USB ports that will fold out to charge your device as needed, although you can only use one at a time. At only 1000 mAh, it is less than the stock battery of almost all webOS devices but is prefect if you just need a little extra juice to get you through the day or want to make sure that you have a short-term back-up solution. Just don't plan on using this if you are not going to be near a charger for an extended period of time. The biggest concern I had with this was trying not to lose it because it was so small, although it does come with a little lanyard you can attach to it to help you keep track on it. In order to charge the BoostPac, you can use the supplied micro-USB cable or any micro-USB or mini-USB cable connected to a wall charger or your PC. When either charging or discharging, there are up to 4 red arrows that appear in the mirrored surface to indicate the level of charge remaining. Unfortunately, there is no way to check the charge level without either charging the battery or charging your device. Compatible Devices: The BoostPac will work with any Pre or Pixi phone, but will not work with the Veer since no Micro-USB adapter for the Veer's magnetic connector exists. While it it does not put out enough power to positively charge the TouchPad, it should be able to slow or even stop the discharge of the TouchPad's built-in battery when connected, thereby still extending its power-on time. The Motorola P790 Portable Charger, available for $29.95 in the webOS Nation store, is a compact 1700 mAh battery pack that will give any of your webOS phones (excluding the Veer) about an extra one-and-a-half charges to your battery. 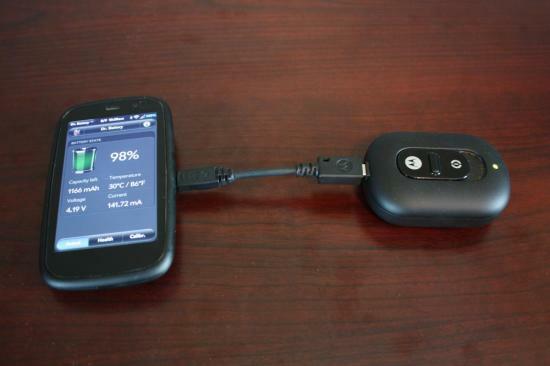 A little bigger than the Qmadix BoostPac, the Motorola P790 measures about 2" by 3" at its widest and is 1" thick and weighs 2.8 ounces, with an mini-USB-in port on one end and a push-out mini-USB connector on the other that turns the battery on. Since this is a mini-USB port, you will need to use the mini-to-micro-USB adapter included in the kit to charge your phone. Although this requires you to hold on to an extra cord/adapter to make it work, this can actually be a nice "feature" since it will give you a flexible extension that will let you fold the charger behind your phone to make it easier to hold in your hand or even put in a pocket. To charge the P790 you can use the included Mini USB Wall Charger or any of your own mini-USB cords attached to your PC. Instead of a series of lights to indicate charge level, the P790 uses a single colored light to indicate how charged the battery is (solid green, blinking green, orange, etc) that displays when either charging or discharging. Compatible Devices: The Motorola P790 will work with any Pre or Pixi phone, but will not work with the Veer since no adapter for the Veer's magnetic connector exists. While it it does not put out enough power to positively charge the TouchPad, it should be able to slow or even stop the discharge of the TouchPad's built-in battery when connected, thereby still extending its power-on time. Available in the webOS Nation store for $54.95, the Seidio Charging Vault Kit has a significant differentiating factor from the other two items above in that it has a built-in wall plug to charge the device, plus two female USB ports that will allow you to charge two devices simultaneously using any USB cable (a retractable charge cable is included that has both a micro-USB and a apple 30-pin adapter). The Charging Value is a little bigger than the alternatives above, measuring 2.25" x 3" x 1" and weighing 4.1 ounces, but it also has a larger battery at 2200 mAh. While the need to carry an extra cable (or two) with you may be a bit of an annoyance, there are two big advantages of this. Not only will it work with the Veer's unique magnetic connector (or any device that has a unique USB connector), but it also allows you to keep the charger in a backpack or your pocket while still having access to your device without any extra bulk directly attached to the device. As mentioned above, all you need to do is plug the Charging Vault it into the wall. There are four blue lights that will indicate the level of charge of the battery that also show when discharging the battery. To charge your devices, just connect one or two compatible USB cables into the Charging Vault and press the button to turn it on. When you are done, either unplug the cables or press the button again to turn it off. 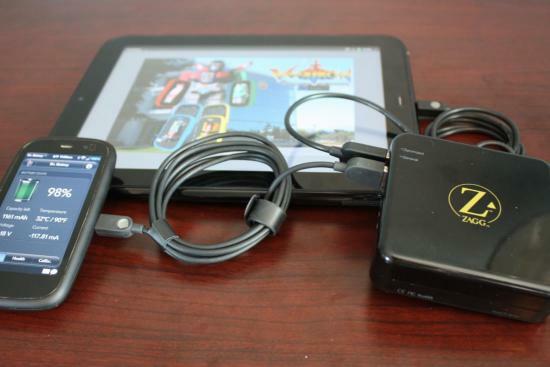 Compatible Devices: The Seidio Charging Vault should work with any webOS smartphone, including the Veer. From our tests, however, it would not charge the Pre3. It worked fine with any others, just not the Pre3. Interestingly enough, although the product page stated that it would not work with the TouchPad, we were able to measure a +100 mAh charge when plugged into the tablet, meaning that it would give you a trickle charge that would slowing add to your battery or prevent it from discharging, but would take almost a day to fully drain the Charging Vault's power. 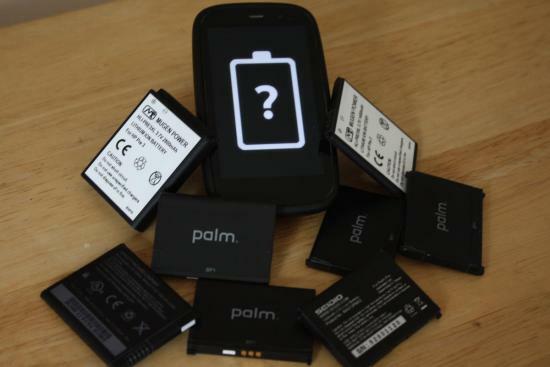 In addition to the backup battery solutions in our webOS Nation store, we wanted to review a few other popular products that you may want to consider. The first one is the line of myCharge Portable Power Banks. Ranging from $49.99 for the Portable Power Bank 1500 mAh up to $99.99 for the Portable Power Bank 6000 mAh, these power packs all have a similar flat rectangular shape but each feature a slightly different set of charging features. For this review, we were using a myCharge 3000 which was 4 3/8" x 3" x 5/8" thick and weighs 4.3 ounces. We don’t have specifications on the others, but expect the 1500 and 2000 to be smaller and lighter, while the 6000 would be thicker and heavier. The 1500 mAh and 2000 mAh myCharges feature just a single USB port where you plug in your device with an included micro-USB adapter (they also both come with a mini-USB adapter and the 2000 comes with an Apple adapter). If you upgrade to the myCharge 3000 mAh (pictured above), you get three built-in charging adapters, a mini-USB, micro-USB and Apple 30-pin connector that can all charge your devices simultaneously. If you need to charge two devices that both have a micro-USB port, grab a mini-to-micro USB adapter like the one that comes with the Motorola P790 Portable Charger Kit above. Finally, you can grab the extra-large myCharge 6000 that will give your webOS smartphone almost 5 full recharges that, in addition to the same connectors that come with myCharge 3000, also includes a standard USB-out port to plug in any USB cable like the Veer's magnetic connector cable. 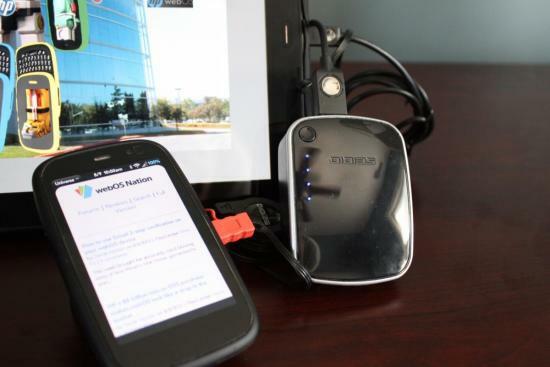 Like the Qmadix BoostPac and Motorola P790, you need to charge up the myCharge using the supplied micro-USB cable plugged in to either your computer or any standard wall charger. To keep track of the current charge level, there are a series of five lights that that you can check at any time by pressing a button on the side of the charger. 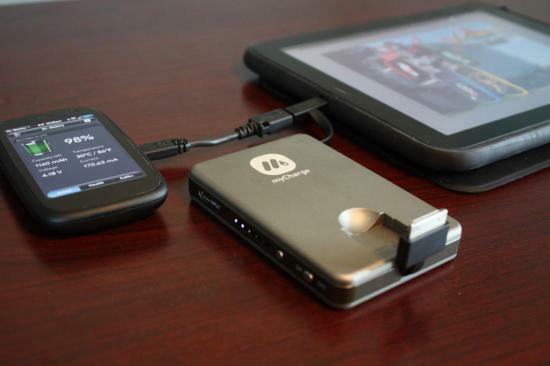 Compatible Devices: All four sizes of the myCharge will power any webOS smartphones with a standard micro-USB charting port, but the myCharge 3000 will not be compatible with the Veer since it doesn’t have a USB port to plug in the Veer-specific charging cable and no Micro-USB adapter exists for the Veer's magnetic connector. In addition, the myCharge 3000 and 6000 Portable Power Banks have enough power to also charge your TouchPad to extend its life by 50% or 100% more, respectively. If you want an extra-large battery charger for on-the-go, you may want to consider the ZAGGsparq 2.0. It is similar to the Seidio Charging Vault Kit, just supersized. Like the Charging Vault, the ZAGGsparq has a built-in wall plug, two USB out ports, and four lights to indicate battery level. However, its capacity is almost triple the size at 6,000 mAh, is a bit larger at 3.5" x 3.5" x 1" thick and weighs in at heavier 8.4 ounces, and costs almost twice as much at $99.99 from the ZAGG website. Another big difference is that the ZAGGsparq has a higher power output that allows it to officially charge tablets like the TouchPad. The only thing to be careful about with the ZAGGsparq is that is seems to lose a significant amount of its charge after just a couple of days of nonuse. Whereas all the other spare battery packs kept all of their charge or only lost a small fraction of their capacity over the course of our weeklong standby test, the ZAGGsparq dropped down to about 50% by day 3, but did stabilize there without any further loss. Compatible Devices: All webOS smartphones and the TouchPad are compatible with the ZAGGsparq as long as you have a USB cable with a micro-USB connector or the Veer's magnetic connector. Our last option to keep your device charged no matter where you are is a whole lot more than just a spare battery pack. From the same makers as the myCharge above, you can pick up a PowerBag in either a backpack, messenger bag or briefcase style, which all include a 6000 mAh battery wired directly into the bag. Well technically, the battery itself is removable and replaceable, but the housing for the battery and all the wires are built right in. Each style of bag comes in multiple models ranging from $139.99 up to $249.99 for their wheeled briefcases, with the $179.99 Business Class Pack used for this review. Each bag has 3 charging connectors--a micro-USB, mini-USB, and Apple 30-pin--as well as a USB port to plug in your own charging cable. While you can charge multiple devices simultaneously, you can only use the micro- or mini-USB connector at one time, but not both, since they share the power output from the battery. You can charge the battery in the pack in or out of the PowerBag by connecting the supplied AC adapter into either the external Water-resistant AC adapter charging port on the bag, or by popping out the battery and plugging directly into it. If charging the battery within the bag, there are 4 LED lights integrated into the fabric of the bag that indicate the level of charge. Pressing the bag's logo (which is actually a button) will illuminate these lights to indicate the current change level, while pressing the logo button for 2 seconds will turn the bag on or off. As for the quality of the bag itself, it is really top notch. There is a great attention to detail and it gives you plenty of pockets for your devices, charging cords, papers, books, or whatever you want. In our Business Class Pack, there was also a section for your laptop that includes a "Checkpoint Friendly" FlyFlat design that will allow you to go through airport security without having to remove it from the bag. Even without the built-in battery pack, this would be our bag of choice for the design alone. While the PowerBag is a great concept, I did find it to have one big flaw. 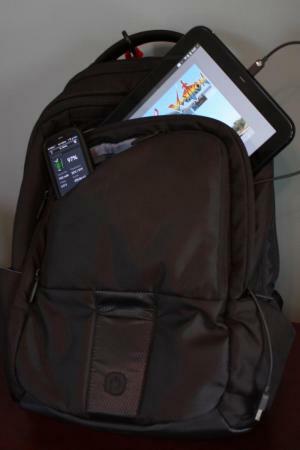 The cord with the built-in micro-USB connector that you would use to charge your phone is not long enough to allow to you wear the backpack and have access to the phone. You would need to pick up a long USB cable and use the USB port to accomplish this, but then you would lose the ability to charge up your TouchPad or a second device at the same time. Instead, I tended to use the micro-USB port in the bag to recharge another portable backup battery included in this review and then use that when I needed to recharge my phone. Note that you can also purchase additional battery packs at the myPowerBag website in 3000 mAh, 6000 mAh or 9000 mAh sizes for $39, $49 or $59, respectively. 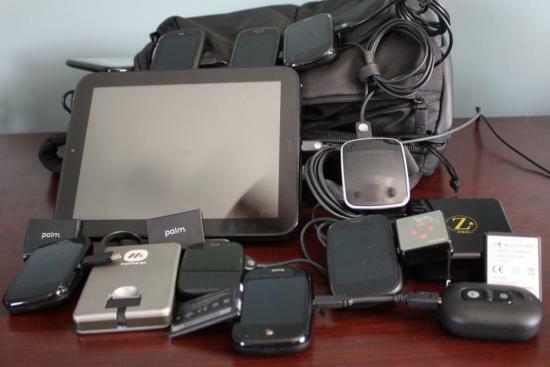 Compatible Devices: All webOS smartphones and the TouchPad are compatible with the ZAGGsparq. However, you can only use the built-in micro-USB connector to charge your phones (excluding the Veer) because it doesn't have enough power to charge the TouchPad. For that you will need to use the USB port and a separate micro-USB cable. You can also use the USB port to charge your Veer as long as you have a USB cable with the Veer's magnetic connector. There are a lot of options that you have available to you if you want to pick up a spare battery pack for your device. Which one is the best one for you to get? Well, that all depends on your budget and your needs. Do you want to be able to charge multiple devices? Do you only care about your smartphone and not a tablet? Is portability more important to you or would you not mind carrying around a bigger and heavier brick of a battery pack? For example, if you just want a little extra "pick me up" to make sure you don’t run out of battery on your commute home, you can pick up the Qmadix BoostPac or Motorola P790 Portable Charger at a lower price point. If you are away from a charger for the majority of the day and want to be sure to never run out of power, then check out the ZAGGsparq 2.0 or the myCharge Portable Power Bank 6000. You also want to determine if you want to carry an extra charging cable with you which would be needed for the ZAGGsparq or the Seidio Charging Vault in exchange for being able to just plug the device into a wall outlet, or if you would rather be able to plug in your device directly to the battery pack. My "dream" battery pack design was, unfortunately, not found in any of these. Ideally, I would have liked a pack that has a built-in wall plug like the Seidio Charging Vault, but also a micro-USB connecter to directly plug your device into. This way, there would never be a need for any extra cables. Unfortunately, it seems like you can only get one or the other, not both. That being said, though, you can't go wrong with any of these battery packs. If I had to pick my personal favorites, it would be the Qmadix BoostPac for when I just need a short-term safety net in a tiny package, and the ZAGGsparq 2.0 or the myCharge 3000 for extended trips away from a charger. Of those two, my choice would depend on if I needed to carry the spare battery pack in my pocket, in which case the myCharge would win, or if I had a bag that I can carry around the ZAGGsparq and extra charging cables.